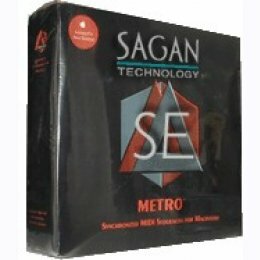 Metro SE is a streamlined version of Metro 6. While maintaining the power of Metro 6, some of the non-essential features have been eliminated thereby allowing to offer this product at an incredibly low price. 8 Sections with up to 32 tracks per section. Up to 4 audio tracks and 2 aux busses. Up to 4 audio effects or 1 synthesizer type plug-in. New Jukebox for playing MP3, and many other file types. Support for ASIO-compatible audio cards in OS 9. Audio functions as shown. (Normalize/Group Normalize in 6.05 or later). Note Pad for keeping notes on individual files. *Metro SE has a limited selection of algorithms in Rhythm Explorer.